Win a Million Dollars is yet another stunning money-themed slot from Playtech crafted with five reels and five paylines. Betting a maximum wager of $25 (one 5$-coin per line, per spin), you get a chance of scooping an immense jackpot award of 200,000 coins! The symbols relate to the world of money and luxury. The regular icons include a diamond, safe, banknotes, coins, dollar signs and other themed icons. The values of winning combinations are displayed on the Paytable page accessed by clicking the Paytable button under the reels. 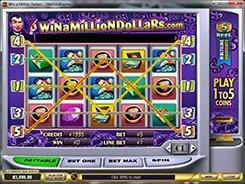 Win a Million Dollars has no scatters and wilds, so free spins are not available. Yet, the slot contains a Bonus game triggered when three or more briefcases appear on the reels. In the Bonus feature, you’ll have to open the briefcases to find stacks of dollar bills and cash prizes inside. PLAY FOR REAL MONEY!